It has been estimated that less than 5%, of people can draw . To many people, the process of drawing seems mysterious and somehow beyond human understanding. This is a terrible and needless situation. This is like saying that before the Industrial Revolution, most people could not read or write, and so no one can ever learn to do so. Anyone who can hold a pencil and write legibly can learn to draw well, whether they are four years old or eighty years old. You just have to teach your brain how to move a pencil in the correct direction. Most people think that drawing is art, but drawing is not art, although drawing does come before art, just as counting comes before math, and the alphabet comes before reading. There are some people who say they can’t learn to draw because they say “I can’t draw”. That’s like saying that a person can’t do learn to count, because they can’t do math, or can’t learn the alphabet because they can’t read. It’s back to front. Drawing is a basic skill anyone can learn. It has to be learned before a person will be a good artist. Somehow people stopped teaching people to draw, if they ever did. Instead the art department goes straight to “art”, and only a few survive. 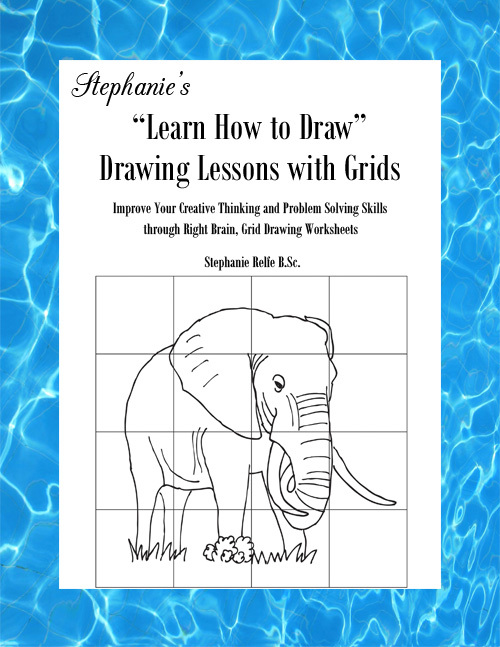 This book will get you started with drawing. This book will get you started. Don’t think you can’t do the exercises in this book because “you can’t draw”! That’s like not learning the alphabet because you can’t read, or not learning to count because you can’t do math! 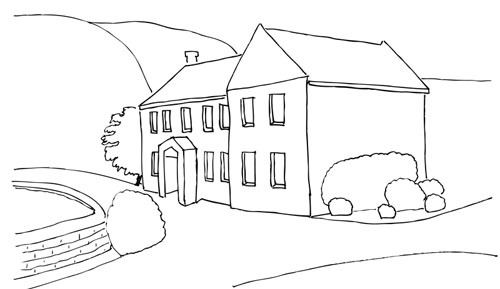 1) Line Drawing. 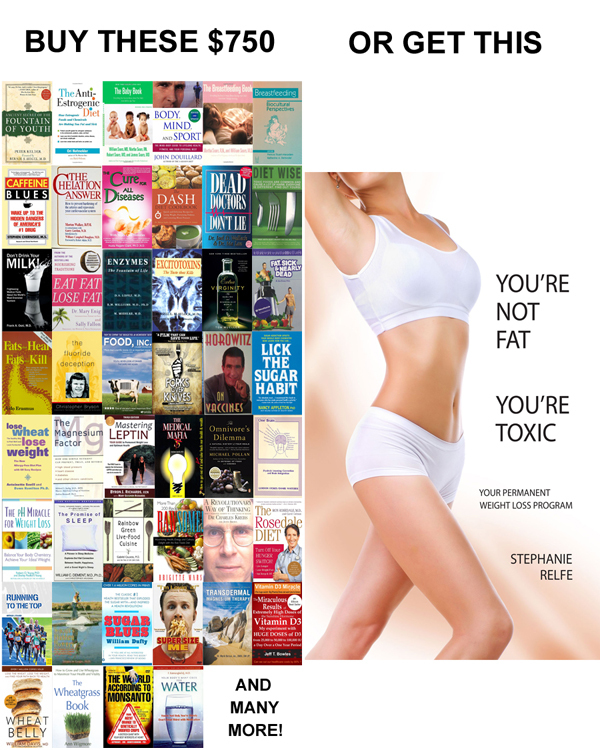 These books will teach you that. Learning to draw is important for everyone to do, not just children, because drawing exercises the right brain, generally. Unfortunately, nearly everything you learned at school exercised only the left brain, which means that most schooling is a half-brained affair. For us to grow to our maximum potential, we must obviously use our whole brain. Because words generally are processed by the left brain, and drawing is an activity that does not use words, drawing is one of the rare activities that will exercise the right brain almost exclusively. On the other hand, most left-brain teaching makes us compartmentalize things and see only part of the picture, without any relationships between the different parts. Plus the left brain is not good at coming up with new ideas, and it is very critical and much more likely to put a person down and stop them from doing anything. While the left brain likes to denigrate right-brain thinking, the left brain can be slower in working things out. The left brain tends to see things in a linear, sequential, logical, step-by-step manner. Everything is separate from everything else. (For example, history is separate from geography, even though the two are often highly related to each other). While the left-brain is more time-oriented than the right brain, the left brain can be a lot slower in the way it thinks. It goes “A leads to B which leads to C so the answer must be … D”. On the other hand, the right brain sees the whole, 3-dimensional aspect of everything, and especially sees how everything is related to everything else. The right brain, using intuition can immediately go “A leads to D!”, without having to view the intermediate steps. Developing your right brain is valuable for increasing your awareness of life, and seeing when problems are present, and then solving them with creative new solutions. 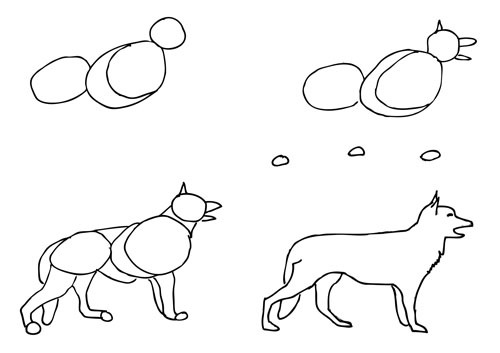 So far as I know, the theory that learning to draw helps people to do creative problem solving was first put forward by Betty Edwards, author of Drawing on the Right Side of the Brain. She does an excellent job of proving this point, and in fact makes a living out of teaching highly successful, professional people to draw, in order for them to solve problems at work. While we think we see everything around us clearly, this is not necessarily true. Light comes into the eyes, and stimulates nerves, which sends signals to the brain, which turn the signals into a ‘picture’. An example of how we do not always see the truth of what is out there is our blind spot. A part of each eye does not have any light-detecting cells, because the optic nerve is there instead, so the brain later on edits the picture and “fills in the blank” according to what it figures should be there. If you are driving and a car behind you happens to be in the blind spot, the brain may edit it out. Incoming data is also edited by the left brain according to a person’s past experiences. Sometimes learning to draw and increasing the power of the right brain, enables one to see the truth of what is around us, more clearly, because the right brain perceives and accepts things the way they are, while the left brain changes the information to fit its programs. What differences do you notice between these two pictures? A major difference is that the left brain picture is 2-dimensional, but the right brain picture is 3-dimensional. When you look at something that you want to draw, you have to see it in a special way. Basically, you have to pretend that you just photographed it so that it is on a flat, 2-dimensional surface, and then trace over the lines. Those lines will not go where your left brain imagines they go. Later one could apply shading to make this drawing even more solid and realistic, and to give more depth, but you have to learn how to do accurate lines before you can do shading. Nearly all children want to draw accurately. 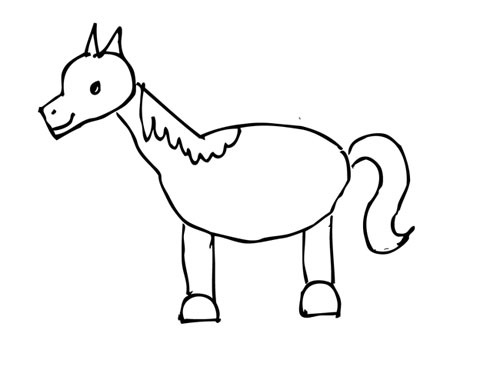 They don’t want to draw a simplified symbol of a horse. They want it to look like a real horse. Children are very smart. They know that the truth is important. They also probably know that it’s really quite simple – they just want someone to show them how to do that. Learning to draw with grids teaches that skill. If you are feeling a bit stressed, try drawing. 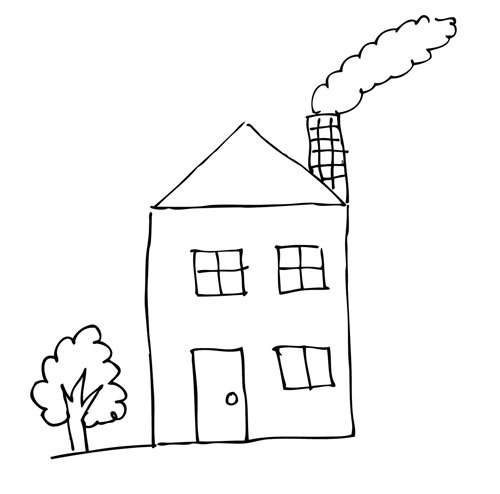 If you have children who are a bit hyperactive, teach them to draw. Artists speak of “feeling transported, “at one with their work”…Awareness of the passage of time fades away and words recede from consciousness. Artists say that they feel alert and aware yet are relaxed and free of anxiety, experiencing a pleasurable, almost mystical activation of the mind.” Others have described this feeling as a feeling of bliss. All of this comes from activating the right brain, without intrusion from the left brain. You may have already experienced this feeling when driving on a freeway, when you are not in a hurry to get anywhere, and so are not focused on time. The right brain has little awareness of time. Like drawing, freeway driving deals with visual images, relationships and spatial information, so it activates the right brain. I remember when I was a child and wanted to learn to draw, and got a bunch of those “Learn to draw…” books. They were all worse than useless. I threw them out. 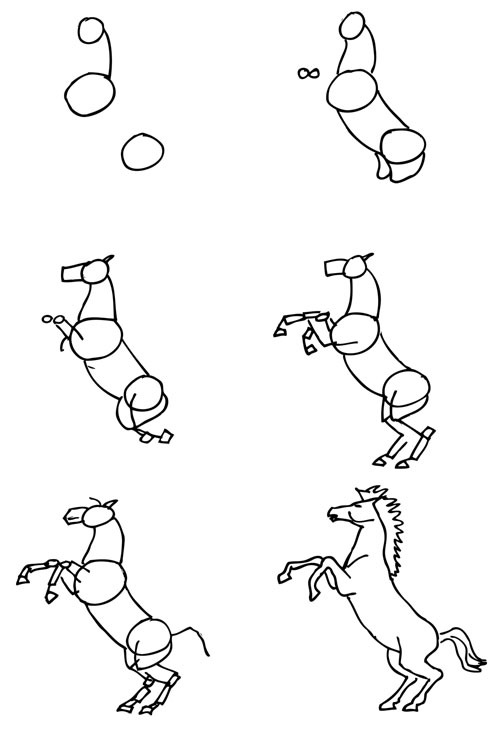 Nearly all of them make you see a horse as a bunch of circles and oval sausages and squares somehow tied together. Then you fill in the ‘missing’ areas. Then you have to erase the parts of the circle that were never there in the first place. Then somehow redraw the areas that were not really circles to begin with. That’s ridiculous! 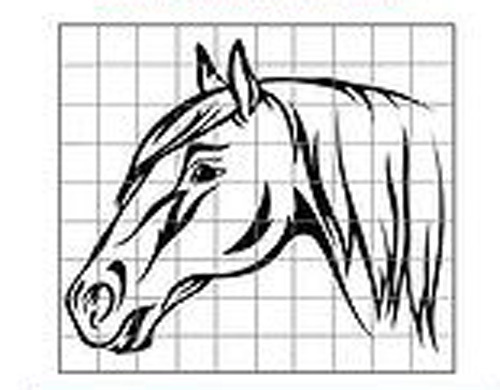 The “Learn to Draw” books that don’t use these stupid circles and blocks, could just as easily be called “What a horse looks like” or “What a dog looks like”. Teaching drawing requires step-by-step lessons. The first step is to learn how to see accurately where the lines are, and to then draw the lines in the correct position that makes a 2-Dimensional drawing look like a 3-Dimensional object. Then you can just look at something, and draw it, accurately, the first time. Most “Drawing with Grids” books use what is called a vector. They get the computer to draw a line drawing from a photo. The problem with this is, the lines are not all the same, and most of them are much too thick. If you are drawing with a thin pencil line, which side of the line do you follow when the line goes thick? 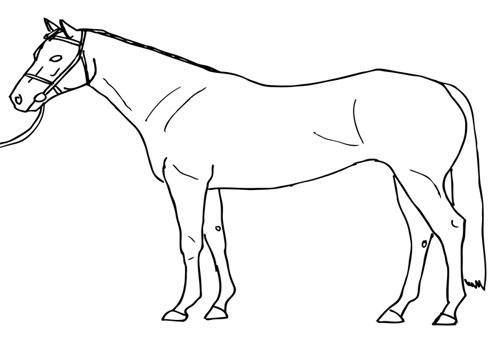 Note another problem in the above vector picture of a horse. There are too many squares. You don’t want to have to count which square you are working on. You want to intuitively know where you are at. For one thing, if you have to count squares, you are activating the left brain, which is the opposite of what we want to achieve with drawing. If you draw enough grids with larger squares, after a while, your brain will learn to judge distances very well by itself. Smaller squares may have their place for very detailed work, but that is certainly not for beginners or even middle learners. The aim of this book is to teach you how to draw accurate, realistic line drawings. 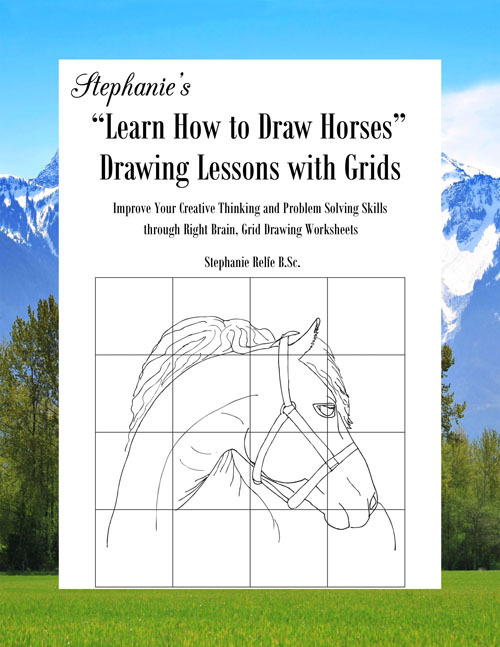 When I look back at my childhood to see how I learned to draw, I am sure the main thing was doing grid drawings, like in this book. Most interestingly, if you have ever wondered how the early art masters created such realistic paintings, many of which look almost like photographs, one of their secrets was that many of them used grids. Many of these artists considered the use of the grid a trade secret. Leonardo da Vinci was just one of the many artists of his time who used this method for developing an accurate outline of live subjects. A frame with string or wire was tied horizontally and vertically in such a way as to create a grid. The device was placed between the artist and the model so that the artist could see the subject through the device, enabling the artist to transfer what he saw onto a grid that was drawn on to his paper. Directly in front of the artist’s face there would be a kind of “sight” that he would put his nose up against. This would keep his line-of-sight consistent throughout the session. When he was finished with the outline he would complete his painting by using the outline as a kind of map. Albrecht Dürer, Draughtsman Making a Perspective Drawing of a Woman. Courtesy of The Metropolitan Museum of Art, New York. Gift of Felix M. Warburg, 1918. A modern version of this device is called The Dürer Grid. How to frame everything so what you want fits inside the borders. Too many people start drawing and then find that part of their picture goes outside the borders. How to focus on making each line appear accurately, in the right place. How to get the left brain out of the way, so that your drawing is realistic. For example, you want to draw a real face with all its interesting shapes, not the simple round circle that the left brain thinks it is. Every time we learn something new, we go through what is called a “learning curve”. This is the time at the beginning of learning something new when everything can seem tough. This is because your brain does not yet have the pathways through its nervous system that it needs to do the activity. Keep going. Your brain will start to make those pathways. When the paths become well trodden, the thing you have been learning will suddenly become easy, and as long as you exercise those pathways once in a while, it will stay easy for the rest of your life. It’s not that people who can’t draw can’t move a pencil. It’s that their brain does not yet interpret how to see correctly, so that they can move the pencil in the correct direction. Old habits of seeing things in a certain way will change once you are able to draw, and you may find that you see and become of the world around you with more awareness. Learning to draw can initially feel uncomfortable, especially for older people, because it uses the right brain, and leaves the left brain out in the cold. Almost everything that people learn in our current society used the left brain only. You have to wake up sleeping nerve pathways in the right brain before it will start to feel easier, but it will happen if you just keep going. When this happens, you may also get to appreciate the world around you more. The left brain is very critical. It likes to categorize everything, while the right brain tends to appreciate things for what they are, without judgment. Keep in mind, before you do as well as you would like, especially if you are an adult where the pathways are more established than they are with a child, you may experience a bit of resistance. Just keep going. It is doing the act that makes the pathways, and eventually makes it easy. An example of this is that it is easier for a person who has learned a language to learn a second language, than it was for them to learn the first language. With drawing, you are making more pathways in the right brain, which probably hasn’t been used as much as it should. If your brain were a garden, the left brain probably looks well tended, but the right brain looks like a wild jungle – because traditional schooling did nothing to cultivate the right brain. In addition, we want to improve the pathways between the left and right brain, because that is what leads to genius. Each time you do some more drawing, it will be easier, and you will draw better, because in the time between doing drawing, your brain will be busy building and improving new nerve pathways in the right brain. All it takes for you to stimulate those pathways is for you to exercise the right brain by looking at a line and then moving your pencil.